First, we have FREE shipping within the Continental US. 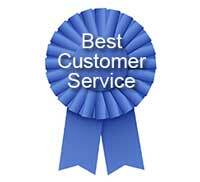 We have the best customer service you will find anywhere. This is because we are a small business. We care about the same things you do, and your business means a lot to us. Our sales and technical support is 100% based in the US. That ensures we'll be easy to understand. When you call us, a real live person will answer right away — you won’t have to go through a phone maze to get help. The person who answers your call will help you until all your questions are answered. It’s something we pride ourselves on doing because we believe it is important. We’re here to help you. We’ve been selling keypad locks on-line since 1997, longer than any of our competition, so we really know our products. We’ve sold over 50,000 locks to customers in the US and around the world. That makes a big difference in terms of product knowledge and helpfulness! We have a great reputation, spanning more than a decade! Check out what our customer say about us and look us up in Google for complaints — you won’t find any because we take exceptional care of our customers; it’s just how we do business. See our customer reviews. We have the lowest prices! To ensure quality and fairness, our manufacturers all have a MAP (Minimum Advertised Price) on most items. Our policy is to price everything at MAP. If you find an item we carry being advertised at a lower price, you are most likely not dealing with a reputable seller and what's more, the item might not be legitimate and the manufacturer may not honor the warranty. Almost everything is in stock. Almost everything on our website is always in stock and ready to ship upon receipt of payment. And if it is not, we'll show you the ETA (Estimated Time of Arrival) while you are making your selection--before you put the item into your Shopping Cart. We ship REALLY FAST! Orders received by noon Eastern Time on a business day are processed the same day. That's because we have streamlined and automated things so that we can process your order, create your shipping label, and send it off to the warehouse within minutes. And even if it is past the noon ET cutoff time, we will still try to get it out that day! Our restocking fees are only charged to people who return items. We don't build the cost of returns into the price of what we sell, so you don't have to pay for other people's returns. Click here to view our Return Policy. We won't ship you someone else's problem! Shipments from Amazon (FBA) and other online marketplaces are returned to the Amazon warehouse where workers with limited product knowledge to inspect the products. If the item appears to look good at a glance, then it goes right back into inventory. Products are not tested and damaged items are not restored. They don't have the resources to do so. The next buyer just inherits the problem. When an item you bought from us is returned, it is sent directly back to the manufacturer who knows and cares about the product. They test, restore, and re-certify each returned item. So, every item we ship is in perfect condition, undamaged, and working properly. We'll give you a preview of the exact shipping cost of your order before you give us your name and address. Just add the items you want to your Shopping Cart so we know the weight and size, then visit the Shopping Cart page, click Shipping Costs Preview, and type in your country, state, and zip code. You will see a list of all your shipping options and prices. We'll lock in your prices with an instant FREE, No-Obligation Quote which will include all costs (products, sales tax, even shipping). Just put your items in the Shopping Cart, proceed to Checkout, and select Free, No-Obligation Quote instead of paying. You will receive an instant email with all your items, prices, and discounts which you can then submit for budget approval. This will lock in your prices for 14 days so you will be protected from any product price increases. Once you're ready to go, you can convert your quote to an order with a single click, make any adjustments you want, and go through Checkout to pay and finalize your order. We have world-class, enterprise-level, online security. The Keyless Locks Store has been a PayPal Merchant since 2006. All our credit card charges and refunds are processed on the PayPal website, not ours. This provides you with the strongest possible privacy and protection against credit card fraud. When you place your order online, we don't see and do not store your credit card information. We store only the minimum information we need to process your order (your name, address and order details). We don't share this information with ANY one under ANY circumstances, unless if we are required to do so by law. Our customers say we have the friendliest and easiest to use website with the most detailed product information. They say it’s easier to find things, the information is more accurate and complete, and they love our extra images, diagrams, and videos. If you’ve looked at some of our competition, you know what we mean! When you buy from us, you are helping your family, friends, and neighbors keep their jobs. That's because we are a small business and we’re 100% American-owned and operated. As our business grows, we’ll continue to hire local people, and not use call centers overseas. Once you know all this, it only makes sense to buy from us. So give us a try and place your order with us today. You'll be glad you did!